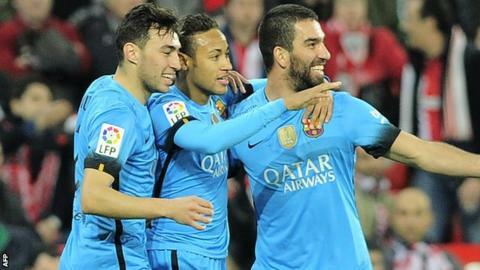 Neymar scored as Barcelona won their Copa del Rey quarter-final first leg against Athletic Bilbao in San Mames Stadium. The defending champions were without the rested Lionel Messi and suspended Luis Suarez, but swept into a two-goal lead inside the first 25 minutes. Munir el Haddadi turned home Ivan Rakitic's cross, before Neymar tapped into an empty net. Aritz Aduriz narrowed the deficit late on, before next Wednesday's second leg. Elsewhere in the same competition, Atletico Madrid drew 0-0 at Celta Vigo.